The group has agreed to look into the case after the NPA announced this week it would not prosecute Moyane for the alleged assault. The mother of the 17-year-old the suspended South African Revenue Service (Sars) commissioner Tom Moyane is alleged to have assaulted has sought the assistance of lobby group AfriForum to pursue a private prosecution against him. 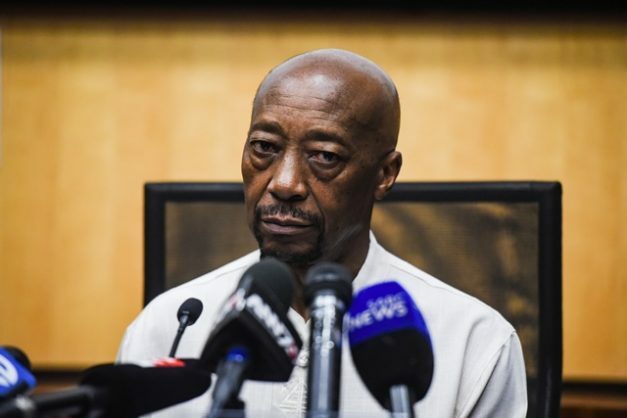 This after the National Prosecuting Authority (NPA) controversially decided this week to not prosecute Moyane for the alleged assault of his 24-year-old son’s 17-year-old girlfriend. EWN reports that the mother of the teenager insists that her daughter had been assaulted and is now looking to AfriForum to assist in pursuing private prosecution. The group confirmed with the publication that it would be looking at taking up the case, with AfriForum’s Advocate Gerrie Nel saying he will meet with the teenager sometime this month. According to the report, AfriForum CEO Kallie Kriel said the mother of the alleged assault victim would also be at the scheduled meeting. “Our investigative team must still look at the matter and they will decide on what route to take forward,” the group was quoted as saying. The NPA decided to not prosecute Moyane because they claimed they did not have a strong enough case to pursue charges. According to media reports, a medical report allegedly showed the teenager suffered a bruised jaw, a cut cheek and a bruise to her stomach, however. She claimed in initial reports that he had kicked her “like a ninja”. The 17-year-old is the mother of Moyane’s six-month-old grandson. Meanwhile, on Thursday the group said it will privately prosecute National Council of Provinces (NCOP) chairperson Thandi Modise for animal cruelty in connection with several farm animals that were found dead on her farm in Modderfontein. The Afrikaner lobby group says Nel will privately prosecute the ANC dignitary after the National Council of the Society for the Prevention of Cruelty to Animals (NSPCA) discovered carcasses of pigs, sheep, geese and ducks on Modise’s farm in 2014. Modise’s spokesperson has since slammed the NSPCA’s threat by AfriForum as an abuse of judicial processes for narrow political ends. Furthermore, the group said earlier this month that it was ready to privately prosecute deputy national director of public prosecutions Nomgcobo Jiba following the Supreme Court of Appeal’s (SCA) recent decision to overturn her being struck off the roll of advocates.